A blog written by Matilda – the "old lady" classic tandem – and her Musings about her adventures, trials and tribulations with the "old git" and Chief Pilot, aka Colin and the "old gal" and Chief Stoker (as well as Chief Engineer) aka Diane. A new book of my Musings and tandeming Christmas presents galore! Is it tandem o’clock yet? Perfect present for the “old git” from the “old gal” – and it links with gin o’clock! Excitement reached fever pitch at Matilda’s Rest on Sunday when Christmas Day finally arrived! The “old git” – who should really be re-named Santa over the festive period! – made sure everyone had their ‘ho! ho! ho!’ on, whether they wanted to or not! On Christmas Eve the “old gal” even put on her Christmas jumper to signal she was in the mood for Santa’s arrival! She had whispered to me that I was getting a present all for myself so I could hardly contain myself! And I knew the “old git” had been planning something with my blog as a present for the “old gal” so it was an exciting time! I could hardly sleep and I am sure I heard Santa’s jingle bells as he and Rudolph delivered his presents around rural Perthshire …. presumably in tandem! Then it was time for my dynamic duo to tear open their presents. The thing the “old git” had been secretly scheming away about was turning all my Musings about our French tandeming tour adventures in the Loire Valley during September into a beautiful hard-back coffee table style book. My daily Musings of our Loire Valley trip turned into a coffee table book! I must say even I was impressed at the what the “old git” had achieved – and you know I’m not easily impressed! – and as for the “old gal” well she thought it was brilliant! There was even a wee tear in her eye as she read the “old git’s” soppy dedication at the front of the book! Awh shucks! Each page is in glossy colour and the book is essentially a full record of each day of my blog – including all the photos – as they appeared on my blog! A great permanent record of a fabulous trip! And great fun to flick through and bring back those memories of my dynamic duo’s days in my saddles in warm sunshine … oh and not forgetting those amazing picnics and wines! 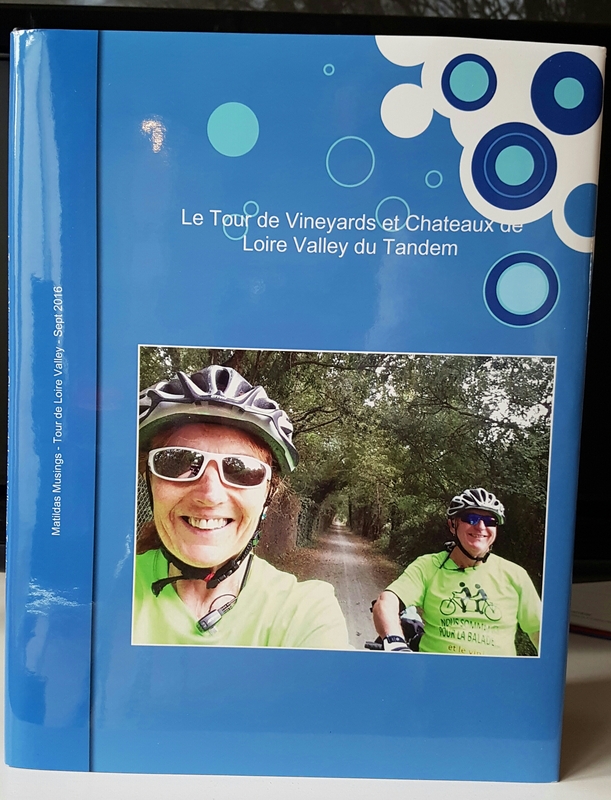 And as a special Christmas treat for readers of my blog you can take a look at the complete book (in a pdf version) by clicking on the title of the book here: Le Tour de Vineyards et Chateaux de Loire Valley du Tandem. Hope you enjoy as much as I did re-reading it all again! My Matilda key ring and coasters to match my la bouclee wine carrier. So then it was time to open my presents, and the “old git” and the “old gal” made sure Santa delivered a nice new leather key ring – complete with my name imprinted on it – in very fetching racy red to match my eye-catching and very French La Bouclée wine carrier, which of course matches my frame. 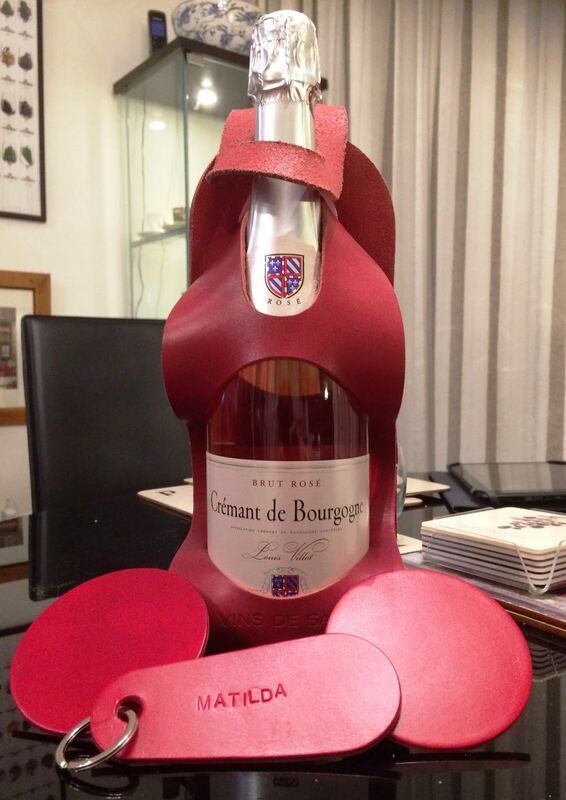 And because the very kind people at La Bouclée have made this “old lady” tandem an ambassador for their products in Scotland, they threw in a couple of leather coasters and some very clever matching accessories which are designed to carry my plastic mock cut crystal glasses on my frame to ensure my dynamic duo will always be able to quaff their prosecco in style! The “old gal” lovingly fitted they keys for my padlock chain to my new keyring and I was suddenly overcome with festive cheer! I mean it is not every tandem that gets a special present all to themselves – and become an ambassador for a luxury French cycling brand at the same time! The “old git” said that it must have been because I was a “good girl” as only “good girls” get presents from Santa! Perfect present from Team Bluebird – fellow Nutty Tandemers Club members. There were lots of other presents to open with a special one from my good friend Bluebird and her tandem team. 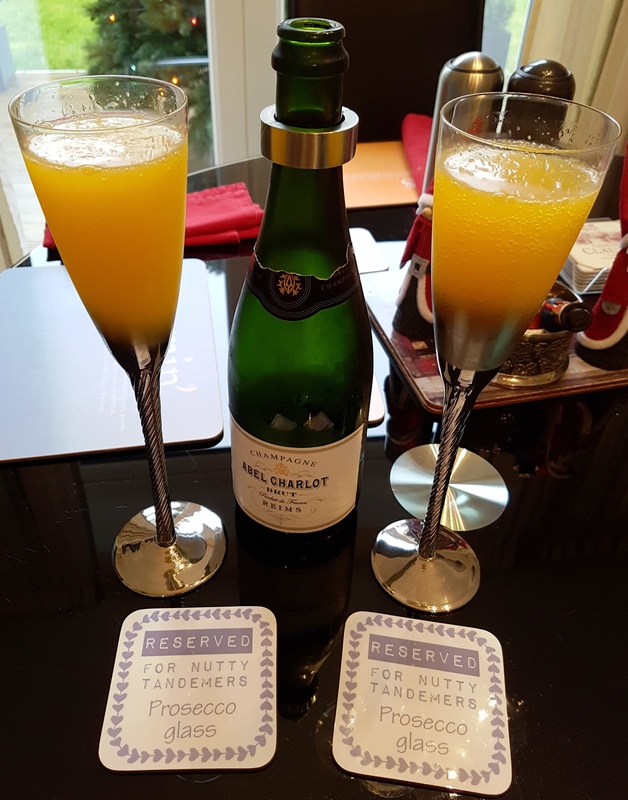 As fellow self-proclaimed members of the Nutty Tandemers Club we all enjoyed a fabulous Le Tour de Perthshire in August – with more than a few bottles prosecco enjoyed! So it was only natural for them to send my team a couple of personalised coasters! I think I can safely say there will be one or two prosecco picnics scheduled for our planned Le Tour de New Forest in July 2017. Calendar time – Tour de Loire Valley on left and also Tour de Perthshire on the right. 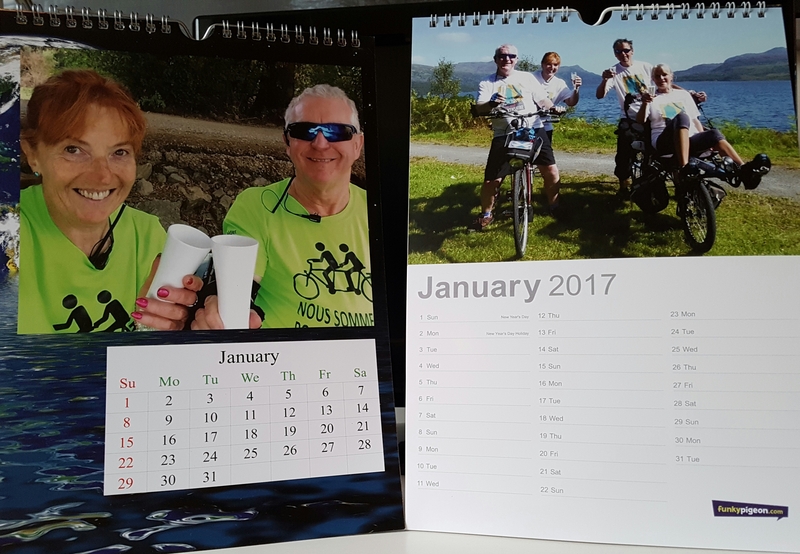 Naturally by dynamic duo had organised a present on my behalf for Team Bluebird and designed a personalised Nutty Tandemers Club 2017 calendar – with each month having a great memory from our wonderful week together touring Perthshire. 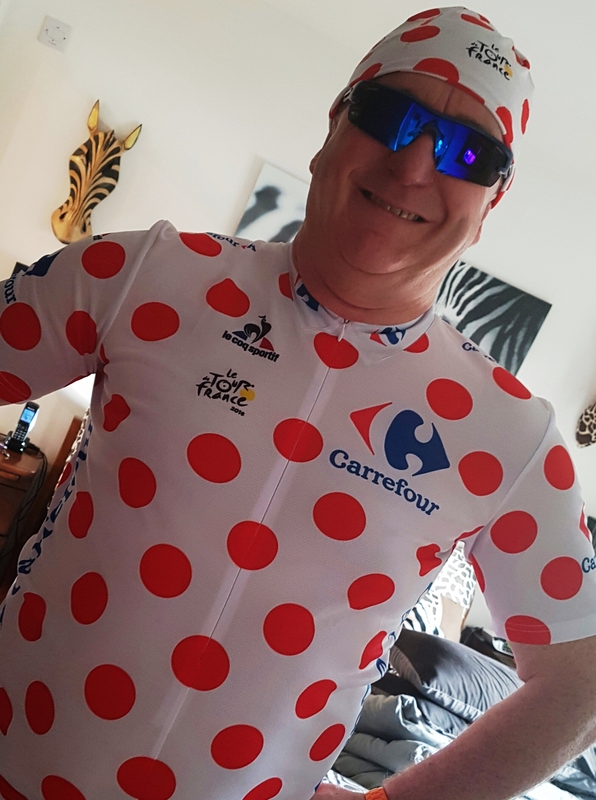 Ever since watching Le Tour de France he has joked that my team should get the distinctive red spotted white cycling jerseys – a maillot a pois rouge – which designate the King of the Mountains rider on the race. This is somewhat ironic given that the spotted jersey obviously identifies the cyclists who is best at hill climbs – and as you know the only hills my dynamic duo really like are flat ones! The “old gal’s” hero! Le Captain in full (ironic) King of the Mountain gear! But the “old gal” duly ordered one of the official Tour de France jerseys to call the “old git’s” bluff. But they were both as bad as each other as the “old git” had got a pair of skull caps in the King of the Mountains spotted pattern – for wearing under their crash helmets in summer as sun protectors. Oh how they laughed …. simple things and all that! Apart from the questionable choice in tandem clothing, the “old gal” did excel with other presents – including the stylish tandem clock pictured at the top of this posting. It really looks quite the business and I am chuffed as it means it will always be tandem o’clock – albeit the “old gal” says it has a special secret link to tie it up with the gin o’clock on the kitchen wall! But I am sure she is joking? Right? The “old git’s” new phone cover with rainbow at Loch Rannoch image. A week before Christmas the “old git” finally came out of the mobile phone dark ages by having his trusty (and very old) Blackberry surgically removed from his grip and replaced with a trendy new Galaxy 7. The “old gal” is quite clever really as she was very persuasive in getting him to upgrade into today’s technology – which means that he can now use Strava to record my rides on his phone so there will be no further opportunities for him to blame “operator error” by my stoker! 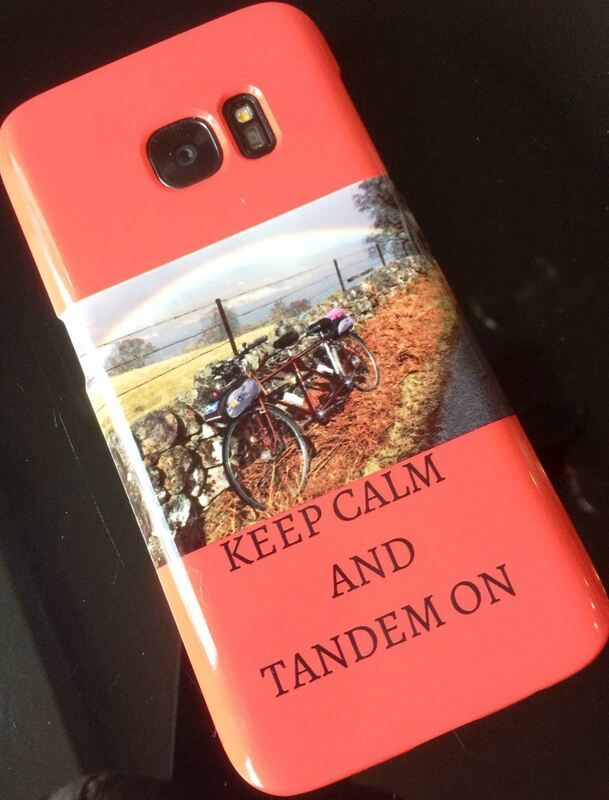 The “old git” was duly impressed with a very apt cover for his new phone – with a Keep Calm and Tandem On slogan and a fab rainbow image at one of Team Matilda’s favourite spots, Loch Rannoch. 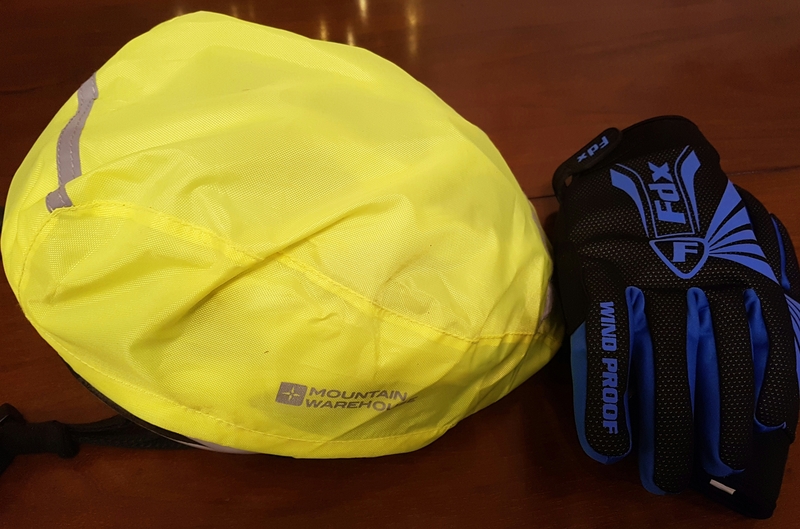 No excuses about weather now – fluerescent waterproof helmet covers and winter gloves! As a game girl who doesn’t mind getting my spokes wet, I personally was pleased about another present which saw my dynamic crew get fluorescent waterproof helmet covers and also winter gloves. There wiill be no excuses about the weather now … or at least no valid excuses! The “old gal” was particularly pleased with the waterproof helmet covers, reminding anyone who would listen how they would have come in useful during the day of biblical rain during our French trip when my crew ended up wearing those fetching blue ponchos! 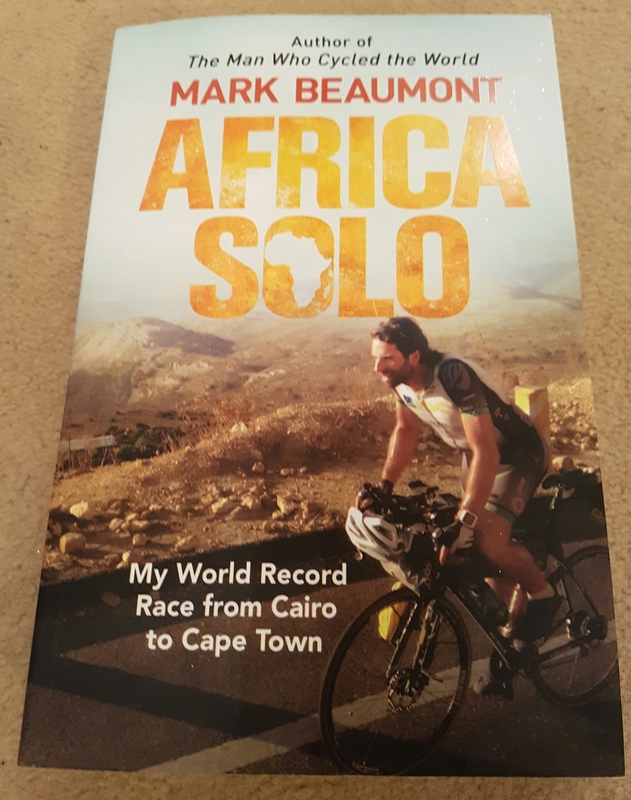 My dynamic duo also have some reading material to fuel their ideas for our grand tours – the Africa Solo book by local adventurer Mark Beaumont from nearby Crieff, and the man who broke the record for cycling round the world! Perhaps just a tad on the ambitious side …. but it will be a good read! Perhaps slightly ambitious reading material for my crew – but a good read! Christmas was spent in a blur of preparing, cooking and then eating and drinking! Just a normal day at Matildas Rest really! Pride of place on the festive table were two bottles of top-of-the-range red wines which my crew had lovingly brought back from our Team Tandem Ecosse Loire Valley trip. The “old gal” was in seventh heaven when she uncorked them and tasted the contents! The magnificent flavours really did bring back fantastic memories of a fabulous time on Le Loire a Velo … and a toast was made to doing a similar wine-tasting tandeming trip in 2017 – with the Alsace region already earmarked as one potential destination! With a busy schedule with family and friends, the “old git” and the “old gal” have scheduled a ride for January 2 to blow away the festive cobwebs – and get rid of some of the excesses – so fingers crossed! 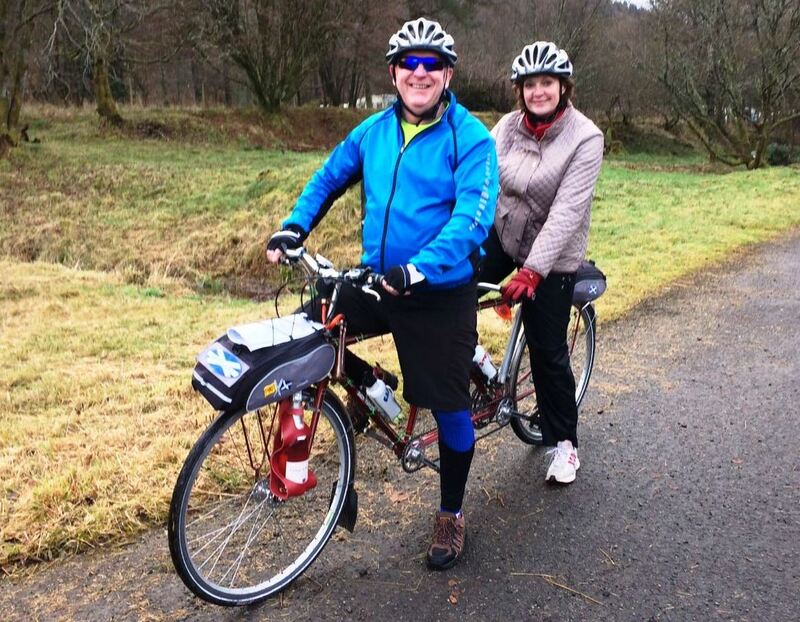 The scenic wilderness of a tandem ride around Loch Rannoch in Highland Perthshire has already been identified as a potential destination. So look out for a new Musing in the first few days of January. 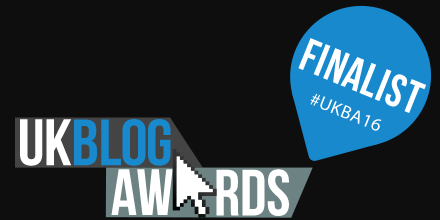 Then in a few weeks I am going to be making a triumphant return to the Loch earn area after being invited back to blog about tandeming around the final part of the award winning and fascinating cultural outside art #BLiSStrail. Yes, LETi, the local Loch Earn Tourism Information group, was so impressed with my photo and video blog when I was a guest to see the Balquhidder section of the trail that Team Matilda has been asked back to do another blog on the Strathyre leg of the unique BLiSS trail – this time based at Airlie House bed and breakfast. @colincalder Thx. Had a wonderful day. Santa left voucher for Matilda tandem ride 2 on the #BLiSStrail Strathyre. Wooohoo. LETi chair Kim found an exclusive voucher from Santa in her stocking for a second go as sub stoker. And it seems that Santa left a highly exclusive voucher for a second tandem ride in the stocking of LETi chair Kim Proven, and owner of luxury self-catering Briar Cottages. Regular readers will remember that Kim had a go as substitute stoker when we visited Balquhidder … and was so overcome by the experience that she fancies having another go! But will the “old git” be as gentle this time as she is no longer a tandem virgin? Or will we be doing tight bends, changing gears and picking up speed? And will Kim show she is a hero and take her hands off the handlebars to wave at the camera this time?! One thing is for certain, I will be Musing about it! That is to come, but finally for the moment, I hope all readers of my Musings had a lovely Christmas and that Santa brought you and your tandems what you wanted! If not then the only explanation is that you were on the “naughty” list! And if we don’t speak until after the bells – on behalf of Team Matilda let me be one of the first to wish you all the best for 2017 … and many happy tandeming miles together for you and your team! Just remember it can always be tandem (or gin!) o’clock! Cheers! May it always be tandem (or gin!) o’clock for your team during 2017! Share Matildas Musings with your friends - Matilda likes new viewers to her blog! ← Christmas wishes to fellow tandemers who know its always better together! Hi there Matty. Sobered up yet or are you still well oiled ? Bet you can’t wait for 2017 and the challenges that lie ahead. Have the old dears told you any of their plans for you ? I suspect not so there’s still time to make a run for it! I’d love to hear what your New Years resolutions are. Hope it’s a good one for you and the old dears and that its uphill all the way ! Hi Dot! Sobered up? Me or you?! As you know I am a good old fashioned “old lady” who never lets the side down, sop never need to sober up … unlike my dynamic crew on the odd occasion! As for oil, well lubrication is the key to a healthy and active s life at my age … that’s s for stress free tandeming obviously! Plans for 2017 are being formulated as we speak … but one thing is for certain … my “old dears” will be trying to make sure it is downhill all the way, and not up! 4 seasons in a day, 2 broken spokes, and 1 speedo error on HebWay training run. De-hibernating by kick starting HebWay training on gusty Hillfoots Loop with cake diversion to Dollar! First pedal spin of the year battling colds and headwinds to finish with a hot tub! Matilda goes carol singing – in dulci jubilo in the winter sun! Errol to V&A Dundee then headwind back for steamin’ scones at Cairn O’Mohr winery! Fine dining Sunday lunch – macaroni pie style! When in Arbroath do as locals do and have an Arbroath Smokie with your picnic!